Starship - To Boldly Go...: We LOVE you Fiji! After Koro, our next stop was the island of Ovalau, where we planned to check out and then head to New Caledonia. Unfortunately there was a big low pressure system brewing, which would have been directly in our path and resulted in some very high winds and rain, so we decided to delay our departure. What were we going to do for another 7-10 days? The snorkeling has been outstanding, but we were ready to do something different. We scoured the guides and decided to go on the hunt for some surfing. 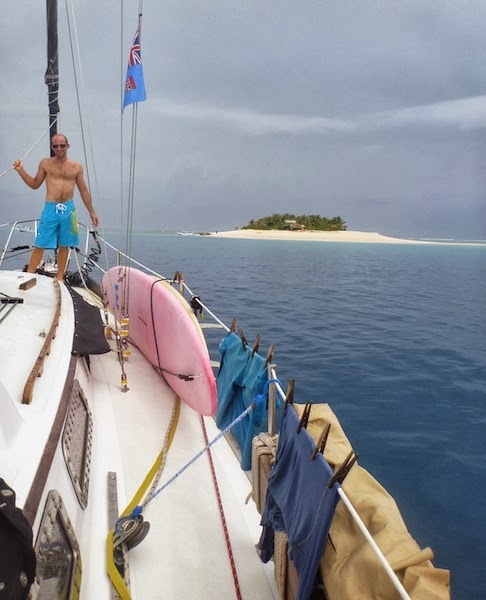 I had read on another cruiser's blog that they had good surfing around Tavarua and Namotu islands, so that's where we headed. It was an overnight sail to get to the "surf spot" with a pretty sunset in the evening, but it was still hard to stay awake during night watch…yikes! The surfing off of Namotu was epic and definitely worth the overnight sail to get there. I was extremely nervous to surf in Fiji, which is often known for it's challenging reef breaks. I felt like a big timid chicken as I entered Twinkle and we motored to the break. "Nerves are normal! You can do it!" was the soundtrack in my brain. I didn't catch the first two waves I tried for, but I didn't hit anything and survived getting tumbled around like clothes in a washing machine just fine. Attempt #3 was a wonderful long ride and I instantly felt transformed into a wave catching tiger. Grrrr…..! From that point on I had the best surfing session of my life :) Chris and I both routinely say how happy we are for the low pressure system that delayed our departure….what a blessing in disguise. We didn't get any pictures of us surfing, but here are some of our big smiles afterwards! Check out the Namotu Island Resort website for some truly spectacular pictures! Look at all the surf breaks we were anchored near! AMAZING! We enjoyed surfing Namotu Lefts, Wilkes and Swimming Pools. No cleats near by? No problem! Chris tying up our dock line to a palm tree! We had a very nice taxi driver (Usman) who took us to the main city of Lautoka to do some shopping. Usman was very friendly and showed us the fresh veggie/fruit market, grocery store and pharmacy. He went into the shops with us, helped to carry our groceries and even bargained with the shop keepers to get us lower prices. And, he did all of this for no extra charge. I don't know if this is always the case, or if it was just a slow day for him, but it was a very interesting experience to spend so much time with Usman and learn his story. We of course gave him a good tip for all of his shopping help. Amazing fruit and veggie market! Fiji has definitely been our favorite stop on our Pacific Crossing. Let me list the reasons why…. ….what more could you ask for? I wish we could spend more time here, but alas it's time to continue west. Today we're heading off to New Caledonia, our second last passage!